This article is about the Ford GT sports car of 2005–2006 and from 2016 onwards. For the 1960s race car, see Ford GT40. For other uses, see Ford GT (disambiguation). The Ford GT is an American mid-engine two-seater sports car manufactured and marketed by Ford for model year 2005 in conjunction with the company's 2003 centenary. The Ford GT began production again from the 2017 model year. The GT recalls Ford's historically significant GT40, a consecutive four-time winner of the 24 Hours of Le Mans (1966–1969), including a 1-2-3 finish in 1966. The Ford GT began life as a concept car designed in anticipation of the automaker's centennial year and as part of its drive to showcase and revive its "heritage" names such as Mustang and Thunderbird. At the 2002 North American International Auto Show , Ford unveiled a new GT40 Concept car. Camilo Pardo, the then head of Ford's "Living Legends" studio, is credited as the chief designer of the GT and worked under the guidance of J Mays. Carroll Shelby, the original designer of the Shelby GT 500, was brought in by Ford to help develop the GT; which included performance testing of the prototype car. While under development, the project was called Petunia. The GT is similar in outward appearance to the original GT40, but is bigger, wider, and most importantly 3 in (76 mm) taller than the original's 40 in (100 cm) overall height; as a result, a potential name for the car was the GT43. Although the cars are visually related, structurally, there is no similarity between the modern GT and the 1960s GT40 that inspired it. Three pre-production cars were shown to the public in 2003 as part of Ford's centenary celebrations, and delivery of the production version called simply the Ford GT began in the fall of 2004. As the Ford GT was built as part of the company's 100th anniversary celebration, the left headlight cluster was designed to read "100". A British company, Safir Engineering, who built continuation GT40 cars in the 1980s, owned the "GT40" trademark at that time. When production of the continuation cars ended, they sold the excess parts, tooling, design, and trademark to a small Ohio based company called Safir GT40 Spares. This company licensed the use of the "GT40" trademark to Ford for the initial 2002 show car. When Ford decided to put the GT40 concept to production stage, negotiations between the two firms failed, thus the production cars are simply called the GT. The GT was produced for the 2005 and 2006 model years. The car began assembly at Mayflower Vehicle Systems in Norwalk, Ohio and was painted and assembled by Saleen at their Saleen Special Vehicles facility in Troy, Michigan. The GT is powered by an engine built at Ford's Romeo Engine Plant in Romeo, Michigan. Installation of the engine and transmission along with interior finishing was handled in the SVT building at Ford's Wixom, Michigan plant. Of the 4,500 cars originally planned, approximately 100 were to be exported to Europe, starting in late 2005. An additional 200 cars were destined for sale in Canada. Production ended in September 2006 without reaching the planned production target. Approximately 550 cars were built in 2004, nearly 1,900 in 2005, and just over 1,600 in 2006, for a grand total of 4,038 cars. The final 11 car bodies manufactured by Mayflower Vehicle Systems were disassembled, and the frames and body panels were sold as service parts. The Wixom Assembly Plant has stopped production of all models as of May 31, 2007. Sales of the GT continued into 2007, from cars held in storage and in dealer inventories. When the Ford GT was first announced, the demand outpaced supply, and the cars initially sold for premium prices. The first private sale of Ford's new mid-engine sports car was completed on August 4, 2004, when former Microsoft executive Jon Shirley took delivery of his Midnight Blue 2005 Ford GT. Shirley earned the right to purchase the first production Ford GT (chassis #10) at a charity auction at the Pebble Beach Concours d'Elegance Auction after bidding over $557,000. A few other early cars sold for as much as a US$100,000 premium over the suggested retail price of $139,995 (Ford increased the MSRP to $149,995 on July 1, 2005). Optional equipment available included a McIntosh sound system, racing stripes, painted brake calipers, and forged alloy wheels adding $13,500 to the MSRP. During the GT's production run, the car was featured on the cover of the video game Gran Turismo 4, and was also featured in Need for Speed: ProStreet, as well as being made into physical form in the Transformers: Alternators toyline, which featured realistic cars turning into Cybertronians; the Ford GT mold was used for the characters Mirage and Rodimus. The GT won Top Gear's Gas Guzzler of the Year award in 2005. One of the show's presenters, Jeremy Clarkson, owned a GT and despite initially reserving high acclaim for the vehicle, ultimately requested a refund from Ford due to extensive problems with the car's aftermarket alarm system. The Ford GT features many technologies unique at its time including a superplastic-formed frame, aluminum body panels, roll-bonded floor panels, a friction stir welded center tunnel, covered by a magnesium center console, a "ship-in-a-bottle" gas tank, a capless fuel filler system, one-piece door panels, and an aluminum engine cover with a one-piece carbon fiber inner panel. The longitudinal rear mounted Modular 5.4 L V8 engine is all-aluminum alloy engine with an Eaton 2300 Lysholm screw-type supercharger. It features a forged rotating assembly housed in an aluminum block designed specifically for the car. A dry sump oiling system is employed, allowing the engine to sit low in the car's frame. The DOHC 4 valves per cylinder heads are a revision of the 2000 Ford Mustang SVT Cobra R cylinder heads (with slightly increased wall casting thickness in the exhaust port). The camshafts have unique specifications, with more lift and duration than those found in the Shelby GT500. Power output is 550 hp (410 kW; 558 PS) at 6,500 rpm and 500 lb⋅ft (678 N⋅m) of torque at 4,500 rpm. A Ricardo 6-speed manual transmission is fitted featuring a helical limited-slip differential. Car and Driver tested the GT in January 2004 and recorded a 0-60 mph (97 km/h) acceleration time of 3.3 seconds. The United States Environmental Protection Agency mileage estimate for the GT is 12 mpg‑US (20 L/100 km; 14 mpg‑imp) in city driving, and 19 mpg‑US (12 L/100 km; 23 mpg‑imp) in highway cruising, for a combined 14 mpg‑US (17 L/100 km; 17 mpg‑imp). The Ford GTX1 is an aftermarket roadster iteration of the Ford GT introduced by the company at the 2005 SEMA Show. The car was built by Mark Gerisch, owner of Gennadi design Group from Manitowoc, Wisconsin with assistance from Ford. Kip Ewing, a development engineer who had been involved in the development of the GT and conceived the idea, supervised the project. The resulting car had a chassis 10% less stiff than the standard GT but this did not impact the performance of the car. The design was inspired by the open top GT40 which was conceived in the 1960s. The car had a modified engine cover, modified doors (with roof portions removed) and a central removal roof bar. Two roof pieces could be installed and removed when the roof bar was installed making the car a T-top, a canvas roof panel would be installed when the roof bar was removed. The car had headrests inspired from the Porsche Carrera GT. The car received a positive response at the show and customers urged Ford to build this version of the GT but the end of the production of the GT in the forthcoming year meant that it would be expensive to produce another limited variant of the car. The GTX1 was offered as a kit by the body shop adding US$38,000 to the price of a standard Ford GT. The involvement of Ford in the process meant that the warranty and other obligations on the car were unaltered. A total of 100 orders for the GTX1 were received and completed over a two year planned production period, these including the exact copies of the SEMA show car. Other modifications on the GTX1 included race seats, a customized interior, new Willwood brakes, a hidden rear bumper and a maximum power increase to 700 hp (522 kW; 710 PS). The GTX1 was featured in various automotive publications along with several reviews, including that of famous motor journalist Jeremy Clarkson who had quoted that it was one of the best cars he had ever driven. At the 2015 North American International Auto Show and at the unveiling of the 2015 racing video game Forza Motorsport 6, a new, redesigned Ford GT was shown to the public with plans for production in 2016. The car marked 50 years since the GT40 won the 1966 24 Hours of Le Mans and competed successfully in the 2016 24 Hours of Le Mans to better celebrate the anniversary, winning the LMGTE Pro class. The car is powered by a 3,496 cc (3.5 L; 213.3 cu in) Twin-turbocharged Ford EcoBoost V6 engine generating a power output of 647 hp (482 kW; 656 PS) and 550 lb⋅ft (746 N⋅m) of torque. The engine shares many components with the F-150's 3.5 L V6 engine including the cylinder heads, block and dual fuel system. Notable differences include larger turbochargers, an aluminum intake manifold, a custom dry sumped lubrication system, unique camshafts and higher strength rotating and timing drive components. 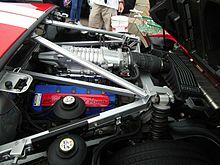 At the time of introduction, the Ford GT had one of the highest specific power outputs of any production car. According to Ford, "the GT will exhibit one of the best power-to-weight ratios of any production car," courtesy of its lightweight carbon fiber construction. Underpinning the GT is a carbon fiber monocoque bolted to aluminum front and rear subframes covered in carbon fiber body panels. The car also has a race inspired pushrod suspension system, active aerodynamics, and dihedral (butterfly) doors. The windshield of the vehicle is made of Gorilla Glass manufactured by Corning, which is also used for manufacturing smartphone screens. The Gorilla Glass is used to reduce the weight of the vehicle by allowing for a thinner windscreen with the same strength as a normal glass windscreen.. The GT employs a four-stage external dry sump oil pump and has an oil capacity of 15.3 US quarts (14.5 L). Production began in December 2016, with a planned production rate of one car per day at Ford's new, low-volume assembly facility at Multimatic in Markham, Ontario, Canada until October 2020. The cars produced for the 2017 and 2018 model years are reserved for selected buyers, the cars produced for the 2019 model year are for buyers who passed over in the initial selection process, and the cars produced for the 2020 model year are for normal customers. A highly modified GT was raced in 2006 and 2007 in Super GT's GT300 class in Japan powered by a 3.5 L Ford Zetec-R engine produced by Cosworth in the mid-1990s for Formula One. A Swiss team Matech Concepts entered three Ford GTs modified to GT3 class specifications in the FIA GT3 European Championship. Matech won the Teams title in the 2008 Championship. Atlanta-based Robertson Racing entered a Doran-built Ford GT-R in the American Le Mans Series GT class (formerly GT2). The team made its first 24 Hours of Le Mans appearance in 2011, scoring 3rd position overall in the GTE Am Class. Black Swan Racing entered a Falken Tires-sponsored Ford GT-R in the GT2 class in the American Le Mans Series during the 2008 season. Ford Chip Ganassi Racing is currently running 4 factory-supported Ford GTs. Two in the FIA World Endurance Championship under the LMGTE Pro class and two in the WeatherTech SportsCar Championship in the GTLM class during the 2016, 2017 and 2018 seasons. The Ford GT1 is a racing version of the Ford GT developed by Matech Concepts to comply with FIA GT1 rules. The official race debut of the Ford GT1 coincided with the kick-off of the 2009 FIA GT Championship season in Silverstone. For the 2010 FIA GT1 World Championship season four cars were fielded by two teams: Matech Competition and Marc VDS Racing Team. Three cars competed in the 2010 24 Hours of Le Mans race, with two (the number 70 car run by the Marc VDS Racing Team and the number 61 car run by Matech Concepts) retiring early on. The third car retired later in the race. For the 2011 FIA GT1 World Championship season, Matech left the series which left Marc VDS running the four cars during the season, two under the Marc VDS Racing Team name and the other two cars under the name of Belgian Racing. The Ford GT was also homologated for the FIA GT3 rules by Matech Concepts. The Ford GT GT3 is involved in numerous championships including the FIA GT3 European Championship, FIA GT1 World Championship, Blancpain Endurance Series, and others. The GT3 version is slower than the GT1 version (producing around 500 instead of 600 HP) and features different bodywork. On 12 June 2015, at Le Mans, it was announced that Ford will return to the 24 Hours of Le Mans in 2016 with a factory-supported, four-car effort operating as Ford Chip Ganassi Racing. The Ford Chip Ganassi Racing cars campaigned in both the IMSA WeatherTech SportsCar Championship and the FIA World Endurance Championship. The car debuted at the 2016 24 Hours of Daytona on January 30–31 finishing seventh and ninth in class. On June 19, 2016 the Number 68 Ford GT of Ford Chip Ganassi Racing finished 1st at the 24 Hours of Le Mans in the LMGTE Pro class; the victory marked 50 years after Ford won the 24 Hours of Le Mans in 1966, where they came in 1st, 2nd and 3rd with the GT40. In the 2016 6 Hours of Fuji and the 6 Hours of Shanghai, both the Ford GT's finished 1-2 at both races, the 67 winning both and the 66 coming second in both. In the opening WEC race at Silverstone, the #67 Ford GT took victory. 2 races later on June 19, 2017 the Number 67 Ford GT of Ford Chip Ganassi Racing finished runner up at the 24 Hours of Le Mans in the LMGTE Pro class; this time 50 years after the 2nd Le Mans Race win in 1967. ^ Stevens, Tim (January 12, 2015). "The new Ford GT is a 647-horsepower, twin-turbo, carbon-fiber sports car". cnet.com. CBS Interactive Inc. Retrieved January 12, 2015. ^ "2005 GT Dimensions, Ford Product Press Information. Retrieved 2010–06–08". Media.ford.com. Archived from the original on October 5, 2012. Retrieved June 29, 2010. ^ Jeff Bartlett (October 21, 2002). "EXCLUSIVE: FORD GT40 Legendary American champion reborn". MotorTrend. Retrieved March 17, 2019. ^ "The Ford GT Has a... 100th Anniversary Clue in Its Headlight". Jalopnik. May 10, 2009. Retrieved August 18, 2016. ^ "Living legend comes to life as Ford delivers first production 2005 Ford GT". Media.ford.com. August 4, 2004. Archived from the original on October 5, 2012. Retrieved June 29, 2010. ^ "Ford GT Delivery – MSN Autos". Autos.msn.com. February 22, 2010. Retrieved June 29, 2010. ^ "2005 Ford GT Prices & Equipment – Consumer Guide Automotive". Consumerguideauto.howstuffworks.com. Archived from the original on August 22, 2010. Retrieved June 29, 2010. ^ "2006 Ford GT Specifications | Used '06 Ford GT Specs at Automobile Magazine". Automobilemag.com. December 13, 2010. Retrieved August 22, 2011. ^ Wyss, Wallace (April 1, 2006). "Ford GTX1". Car & Driver. Retrieved November 28, 2018. ^ "Ford GTX1 production comes to an end". Autoblog. January 6, 2008. Retrieved November 28, 2018. ^ "Ford turns to Ontario's Multimatic to make GT concept car". cbc.ca. February 13, 2015. ^ Bob Sorokanich. "Chris Svensson, Designer of the Ford GT, Has Died". Road and Track magazine. Retrieved July 27, 2018. ^ "2017 Ford GT First Test: The Price of Priceless". motortrend.com. January 21, 2018. ^ "Ford GT Supercar Returns". RSsportscars.com. January 12, 2015. Retrieved January 23, 2015. ^ "The Ford's GT's windshield will be Gorilla Glass, just like your smartphone screen". theverge.com. The Verge. December 15, 2015. Retrieved December 16, 2015. ^ "Ford GT to Use Weight-Saving Gorilla Glass Windshield". Mortortrend.com. The Enthusiast Network. December 15, 2015. Retrieved December 16, 2015. ^ "Ford Will Build One GT Per Day From December 2016 to October 2020". Road & Track. October 24, 2016. Retrieved October 26, 2016. ^ Collins, Sam. "Ford GT300", Racecar Engineering, December 11, 2007[permanent dead link], retrieved 2009–12–11. ^ Collins, Sam. "Ford GT GT3", Racecar Engineering, December 11, 2007 Archived January 18, 2010, at the Wayback Machine, retrieved 2009–12–11. ^ "Ford GT returns to Le Mans 2016". Ford GT returns to Le Mans 2016. Retrieved March 16, 2016. ^ "Multimatic Playing Major Role in Ford GT Program - Sportscar365". sportscar365.com. Retrieved March 16, 2016. ^ "Rolex 24 at Daytona: Official Race Report" (PDF). Official Results: Rolex 24 at Daytona. International Motor Sports Association. Retrieved March 16, 2016. ^ "Ford GT wins at Le Mans, first since 1980". Detroit News. Retrieved June 20, 2016. ^ "FORD WINS LE MANS!". media.ford. Ford Motor Company. Retrieved August 16, 2016. ^ "Ford battles door issues to grab Silverstone WEC win". Motorsport.com. Retrieved June 21, 2017. ^ "Final lap of Le Mans GTE battle "like a movie" - Tincknell". Motorsport.com. Retrieved June 21, 2017. Wikimedia Commons has media related to Ford GT.